Sadie Dupuis is seeking liberation on Slugger, whether it is from the hypocrisy of critics who don’t care about the work and just want the piece of the hype, from the hold of unhealthy relationships or from a society that hasn’t learnt to give any importance to consent. Moreover, Slugger is also looking to be free from the boundaries of genre as the album is on a completely different track from the signature guitar grunge of Speedy Ortiz. Dupuis is the songwriter, guitarist and lead singer of this band. While the album is not a complete departure from style, Sadie proves that an ever-evolving artist can use labels fluidly by using a familiar electric force in Slugger. Dupuis has often stated that her inspirations are singers like Kelis and Nicki Minaj so a solo pop album doesn’t really come off as a surprise. The Speedy Ortiz discography boasts the power and playfulness seen in these singers and they have formed the basis in the new album as well. Some new genres have also been explored in Foil Deer and the record comprises of some catchy melodies and electrical instruments. ‘Basement Queens’ was the first song released under the moniker Sad13 and had been co-written with rapper Lizzo. Both of them possess distinct musical and lyrical voices and the striking flow of the rapper compliments Dupuis guitar raffs rather seamlessly. Slugger also boasts the energy of this debut track as it is a combination of catchy pop synthesizers around melodic choruses and stylized guitar effects. A unique bedroom pop quality is also noticeable in the record. There is a certain DIY feel to it because it has been formed through a combo of intricate instrumentation of personal bedroom material and pop music. Nonetheless, fans of Dupuis’s band can breathe easy as there is still plenty of grunge included in the album. ‘Krampus (In Love)’ and ‘Line Up’ are a blend of electronic keyboard buzz and choppy fuzz. Dupuis has borrowed a great deal from the song structures of the 90s. Also, the pop is not the only thing impactful as the lyrics are also worth discussing. 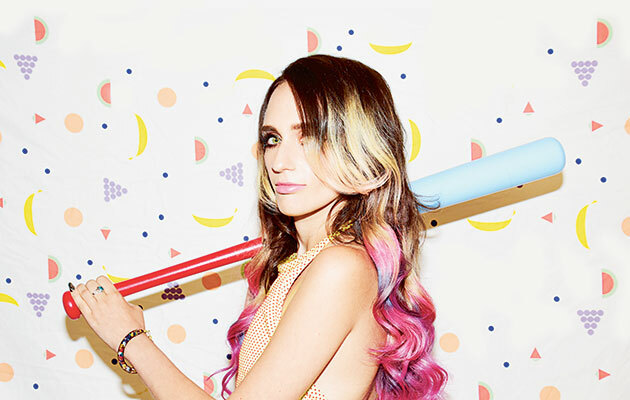 It is obvious through Speedy Ortiz’s songs that Dupuis is an excellent songwriter and she is able to explore more political and personal ground in a pop context. ‘Hype’ is aimed at teaching people to value their female pals, thereby rejecting the stereotype that women are vindictive and spiteful. Dupuis has also released a consent anthem in the form of ‘Get a Yes’, which is a poignant subversion in an era where female autonomy is constantly undermined. Slugger also has some intimate moments for balancing these powerful statements. ‘Devil in U’ deals with unhealthy relationships and emotional manipulation. It is a highly effective song as it comprises of the imagery associated with witchcraft. ‘Coming into Powers’ is the perfect end where Dupuis is envisioning a world of total empowerment for everyone and it features rising rapper, Sammus. It is clear that Sadie Dupuis evolving and is not willing to stop at any cost.